Urmila Sathyanarayanan is perhaps the brightest among the new generation of Bharatanatyam dancers. She is among the most inspired and dedicated Bharathanatyam exponents of her times with dancing experience of over three decades. Nimble move¬ments and the pristine purity of her expressions, helped by her intrinsic charisma and irrepressible cheerfulness, create spellbinding magic, holding the watcher in thrall. Her dedication to dance is total and Bharathanatyam is richer by her experience, expertise and most importantly devotion. Since her debut in 1976, Urmila has presented dozens of recitals in India and abroad and earned excellent reviews from eminent critics. She has danced in practically every dance festival in India. She has toured Europe and USA extensively and participated in the ‘Festival of India’ at Edinburgh. Titles and awards apart, her dedication to the art is total. 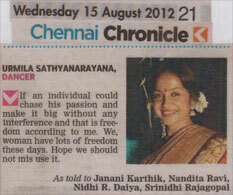 Bharathanatyam is richer by her experience, expertise and most importantly devotion. Restless with her achievements in the field Urmila soon founded her own institution, the “Natya Sankalpaa” and is actively engaged in imparting training to aspiring students.